Waivers for entrance into the military are available, but they are not easy to obtain. 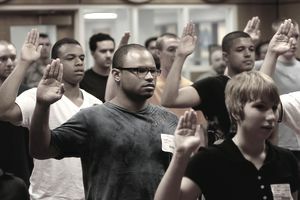 There is a long list of reasons why the military may disqualify a potential recruit: illegal activity, medical conditions, minimum height, and even age. The recruit needs to have a compelling reason for requesting a waiver, and even then it's not guaranteed. In order to get approval for a disqualifying issue, you will need a recruiter who knows how the process works and who is willing to invest the time and effort. But that's only the first step. Once the recruiter agrees to put in a request for a waiver, the chain of command will have to approve it. The more serious the waiver the higher up the chain of command it will have to travel, and the longer it will take. Common waivers have an easier process to follow. The more difficult issues, such as seeking a waiver for a serious medical condition or criminal activity, usually have a strict timeline and are much more difficult to obtain. There are several common waivers people apply for. Some are almost guaranteed depending upon the job, and some are almost always denied. Here are the most common waivers. Morals (criminal history) Waiver: Getting a waiver for a felony record is rare, but in times of need such as war, many of these waivers may be approved to meet staffing requirements. Juvenile records are subject to review as well by the military. LASIK and PRK Vision Repair Surgery: Usually waivers for recruits who have undergone LASIK or PRK eye surgery are easily processed but require a six-month post-surgery recovery time first. After receiving a clean bill of health from a military doctor, the waiver will be processed (note this doesn't guarantee approval). Color blindness: You can be color blind and still join some branches of the military but may not qualify for certain jobs. For instance, a number of combat operations jobs in the Navy and Marine Corps require personnel to be able to see vivid reds and greens. The same goes for many special operations and aviation jobs (the Air Force is particularly rigid about enforcing its color-blindness disqualification). Asthma: The recruit has to be able to prove he or she no longer has asthmatic issues or takes asthma medications. ADHD /ADD: Often younger children can be misdiagnosed or grow out of such behavior and focus issues. Full medical records are required if the applicant was ever treated for ADD or ADHD with any medication other than Ritalin, Adderal or Dexedrine. Broken bones: If you have a broken bone that has healed without surgery, you're likely to have your waiver approved. However, surgeries with metal or other instruments to secure bones and ligaments or other body parts can be disqualifying. You will need all associated paperwork from your doctor, surgeon, physical therapist to present for military medical review. Age: Jobs in special ops rarely have age waivers, but they do occur on a case by case basis. Regular military age waivers for professional jobs in the legal, medical, religious fields are often waived due to force requirement needs.